discard whatever it is you have written. 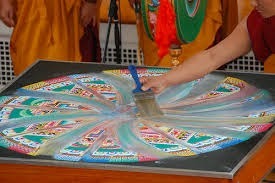 Write your own sand mandala. Do not keep notes toward what you have written. Do not save drafts. Do not memorize passages to keep for later. Do not tuck them discretely under a folder or notebook when no one is looking. Instead when time is up for your writing session, press delete, drag the item to e-recycling bin or crumple the sheet of paper into an actual waste bin. Using a paper shredder might be a better option for it keeps at bay the temptation of retrieval. 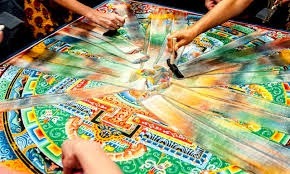 Write your own sand mandala—art that gets blown away. Reach beautiful insights, find colorful structural strategies, realize new points and segue, create whole stretches in an aesthetic approach—and then erase. This deletion is a different type of deletion from the norm for it is not the back stepping, not the hitting of the backspace bar as one writes, it is not the false mixing of composing with editing, of generating with pruning, of writing with proofreading. Typically, there is much deletion as part of a writer’s process, deletion that causes more harm than good, that overlooks the absence of the audience in the present, that anticipates a future audience and is defensive toward it. The deletion of disposable writing is different for it is a deletion of product, not process. We follow the moment, we enjoy the motion of writing, and at the end we relinquish product, unattached to outcome. · Those who spend time daydreaming about product and outcome, of how the end result of writing will personally benefit them, change their status, improve their lot with others or with themselves. · Those who don’t see writing as a movement occurring in time but instead as an object, static, like a trophy or an expensive knick knack. The benefits of disposable writing are the lowering of standards the practicing of detachment. For the practitioner, there is trust in this letting go: one trusts the abundance of impermanence, knowing that just as good writing arose in this moment, it will arise again in another moment. What does one write when keeping nothing? Write as one would normally write or write as one would not normally write, but at the end, delete. Write with an audience in mind or write with no audience in mind, and at the end, shred. Give oneself a focus, genre, approach, or do not give oneself a focus, genre, or approach and instead freewrite, and at the end, crumble. Write the next step in a draft on a particular project or begin something new. The content, stage, and genre do not matter—as with any writing session, decide those on your own—but at the end, delete. Many find the disposable method most useful and least intimidating if done with freewriting or with the earliest stages of invention. A person of advanced training in the mindfulness of writing will practice disposable writing at advanced and more polished phases and with genre of increasing distinction. You can of course decide to retain something you’ve created, but don’t allow yourself this trump card too often for the lessons of disposable writing then will retreat and the benefits of acknowledging impermanence will fade away. It is possible to keep your writing and at the same time maintain the disposable mindset: this requires a sincere dedication to impermanence while you write, a true tracking of the passing moments. It is possible then to cheat the recycling bin, keep the results of your honoring of importance, but the person who does so must have a strong mindful writing practice. For it is too easy to become ensnared in attachment. Write your own sand mandala—art that gets blown away.